Dal profondo is a short horror movie that recalls the foreboding films of 70s-era Roman Polanski and the literary works of Lovecraft, Stephen King and Edgar Allan Poe. Having played at the Cannes Film Festival’s edgy Short Film Corner in 2013, the 20-minute pic is set to satisfy a unique and mixed audience of art house, indie as well as genre fans this Halloween. A sumptuously faded villa in the lush Italian countryside is the setting of this deceptive thriller, which leaves its audience guessing with a haunting climax. Powered by the icy, reptilian performance of lead actor Davide Bardi, the short concerns a vacationing couple whose marital bliss is quickly dissolved by a mysterious force in the swanky dwelling. 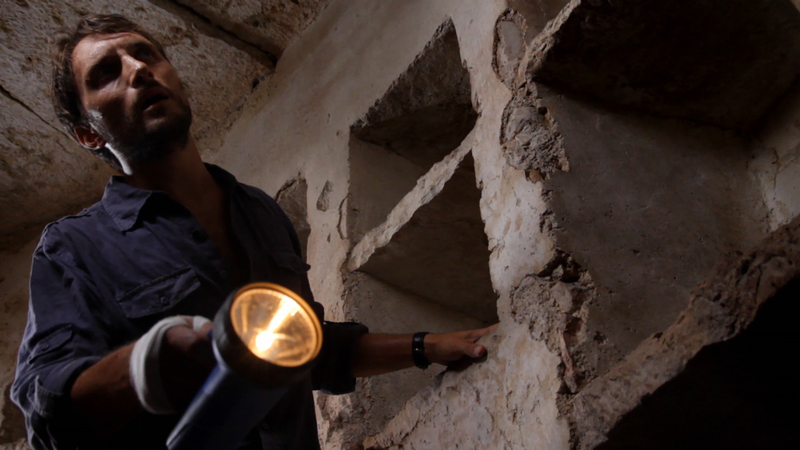 Director Luca Caserta talks horror, the archeology of memory, metaphor and more on the IndiePix Blog. Hi, Luca. I want you to talk a little bit about genre. In America , horror films are ignored by critics but popular with audiences. What is your interest in the genre? Day by day we receive increasingly terrible news from the daily papers. I don’t think it’s a coincidence that in a very difficult social period such as the one we’re living in there’s a rise in popularity in horror movies. Horror can be used to tell something about human relationships, historical events, about what happens around or inside us. I think this socially relevant slant in your work is what made the film friendly to a Cannes Film Festival audience as well. The audience in Cannes was very interested in the meanings beneath the plot and that was great for me. Dal Profondo is inventive in its use of a very old world European villa as the primary setting. The idealized romantic getaway becomes a trap, revealing the tensions hidden within a marriage. There is a subtle, creeping sensation that something awful is going to happen in every scene. I was looking for a specific building that could match the idea I had for my story. I needed a place that could instill loneliness, isolation, and restlessness. Finally I found this great set at villa Pellegrini near Romagnano, a very small village in the hills outside Verona. The building dates back to the 18th century: a part of it has been restored and is occupied to this day; the other one has been left as it was. I shot the interiors in the rooms of the abandoned section, using as set decoration the numerous furnishings I found in the huge loft, which fills an entire floor upstairs. What is the relationship between place and the subconscious in the film? The English translation of the film’s title is “Out of the Depths” which obviously suggests we look beyond the surface. There’s also a mystery or two coming from the basement. It can be read literally as well as metaphorically. In Dal profondo the basement is the core: Andrea’s descent into the cellar is a path into his painful and repressed memories, it’s a digging into his subconscious. The story deals with the archaeology of memory: awful events have occurred in his childhood and now he must face them. Since the beginning the mansion establishes a connection with Andrea and uses his fears and memories to subjugate and influence him for its purposes. Something terrible lurks in the dark and is ready to come out of the depths again. It reminds me of “The Fall of the House of Usher” in that sense, as well as some films by Polanski where the apartment, the domestic environment plays a pivotal role. The mansion as a living thing, which establishes a mysterious connection with the people that inhabit it, is a known theme in the horror genre. The building has a powerful symbolic meaning for me. It’s something that deals with memories, the subconscious, family, and intimacy. It’s also dealing with the feminine. In a sense it’s natural to compare the house with the uterus – it’s something that deals with the primordial part of the human soul. Can you talk about your technical process in creating the mood, the atmosphere of the movie? I like to have different levels of interpretation: there’s a surface reading, which is the plot and is easy to access for everyone. Under it, there are symbols placed in the shots and in the script that add extra levels of meaning linked to form a deeper metaphorical and conceptual picture.I worked on shots that would insinuate the sensation that everything was a bourgeois mise-en-scène, that everything was insincere between the couple. I’ve tried to communicate this with the positions of the actors in the shot…their bodies are more and more physically distant and different as time passes by.The use of medium-long and long shots made it possible to emphasize the ambience, as if they’re oppressed by it: the mansion literally looms over them… decaying rooms and halls, where light and shade alternate. Ancient furnishings reveal the layering of ages and the building’s gradual state of abandon. The sound design plays an important role too. There’s a magnificently unsettling scraping sound that’s hard to forget. At the beginning of the movie, when Elena and Andrea pass through the old villa’s gate and cross the wood, there’s no sound coming from the surroundings: it’s like they enter into an abandoned place, suspended in a bubble, frozen in space and time. Then, after the mansion has awakened, sounds slowly come back: bumps from the basement, scratching noises inside the walls, creepy vibrations, incorporeal voices and so on. 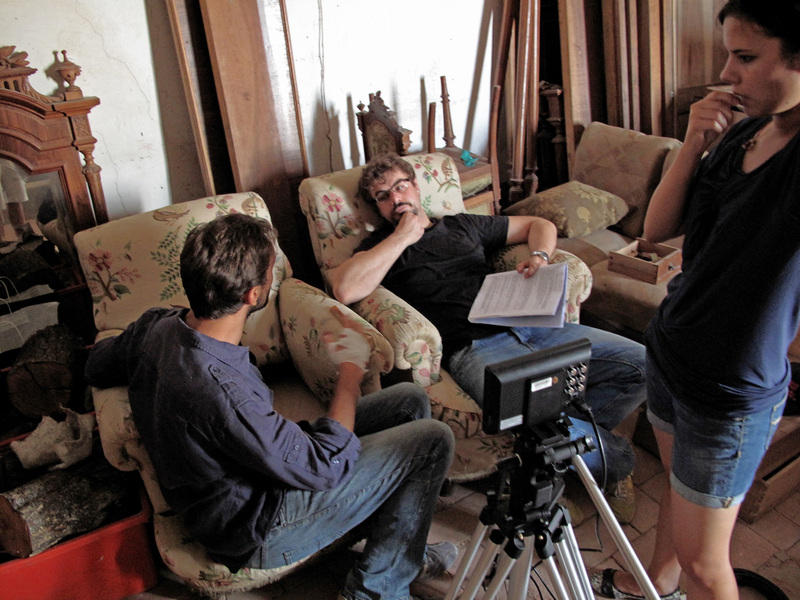 A lot was already made on the set with the sound-recordist Tommaso Ferrari, but during the audio post in Rome at Gruppo Cineaudio, I worked on removing sounds from the shoot to create a really aseptic atmosphere. When dealing with aspects of abstract horror, how did you approach your conversations with your actors? Davide Bardi was able to communicate warmth and cool indifference in the same breath. What particular skills did they need to draw from? We started with the back-stories. I told them that both Andrea and Elena are insincere, that there’s a lot unsaid and a lot of bourgeois respectability in their way of talking. I told Elisa that Elena is a deceiver: she’s controlled, rigid, obsessed by order and perfection, maybe suffering from a mild obsessive-compulsive disorder. I talked with Davide about Andrea’s careerism: under his charming smile, he’s a cruel and hypocritical man, egotistical and unable to feel love for someone except for himself, ready to crush anyone for his own interests. I asked him to imagine Andrea as a reptile, a slimy snake ready to bite. Davide focused his work on the image of a cayman, which moves under the surface with only his eyes outside the water. There is also this image of the refined couple in the countryside who have their wonderful weekend ruined, to say the least. In some ways I thought this could be seen as a social critique. Watch Dal Profondo now via IndiePix On-Demand…. This entry was posted on Monday, October 27th, 2014 at 12:25 pm	and is filed under IndiePix Films, Interviews, Trailers. You can follow any responses to this entry through the RSS 2.0 feed. Both comments and pings are currently closed.